This volume was written in preparation for a short course by the same title, sponsored by the Mineralogical Society of America, October 22 and 23, 1999 in Golden, Colorado, prior to MSA's joint annual meeting with the Geological Society of America. Research emphasis in traditional mineralogy has often focused on detailed studies of a few hundred common rock-forming minerals. However, scanning the contents of a current issue of American Mineralogist or Canadian Mineralogist, or the titles of recent Reviews in Mineralogy volumes reveals that the emphasis of mineralogical research has undergone considerable change recently. Less-common, low-temperature minerals are receiving ever increasing attention, often owing to their importance to the environment. A tremendous challenge lies ahead for mineralogists and geochemists: the occurrences, structures, stabilities, and paragenesis of perhaps a thousand low-temperature minerals require detailed study if geoscientists are to be properly equipped to tackle environmental problems today and in the future. In many low-temperature environments mineral assemblages are extremely complex, with more than 10 species common in many em-size samples. This Reviews in Mineralogy volume provides detailed reviews of various aspects of the mineralogy and geochemistry of uranium; hopefully the reader will benefit from this presentation, and perhaps more importantly, the reader may develop a sense of the tremendous amount of work that remains to be done, not only concerning uranium in natural systems, but for low-temperature mineralogy and geochemistry in general. The low crustal abundance of uranium belies its mineralogical and geochemical significance: more than five percent of minerals known today contain uranium as an essential constituent. Uranium is a geochemical and geochronological indicator, and the U-Pb decay series has long been one of the most important systems for dating rocks and minerals. Uranium is an important energy source, and the uranium nuclear fuel cycle has generated a great deal of interest in uranium mineralogy and geochemistry since the first controlled nuclear fission reaction nearly sixty years ago. Current interest in uranium mineralogy and geochemistry stems in large part from the utilization of uranium as a natural resource. Environmental issues such as coping with uranium mine and mill tailings and other uranium-contaminated sites, as well as permanent disposal of highly radioactive uranium-based nuclear fuels in deep geologic repositories, have all refocused attention on uranium. More than twenty years have passed since the 1978 Mineralogical Association of Canada's Short Course on Uranium Deposits. A realignment of research focus has clearly occurred since then, from exploration and exploitation to environmental remediation and geological "forecasting" of potential future impacts of decisions made today. The past decades have produced numerous remarkable advances in our understanding of uranium mineralogy and geochemistry, as well as technological and theoretical advances in analytical techniques which have revolutionized research of trace-elements, including uranium. It was these advances that provided us the impetus to develop this volume. 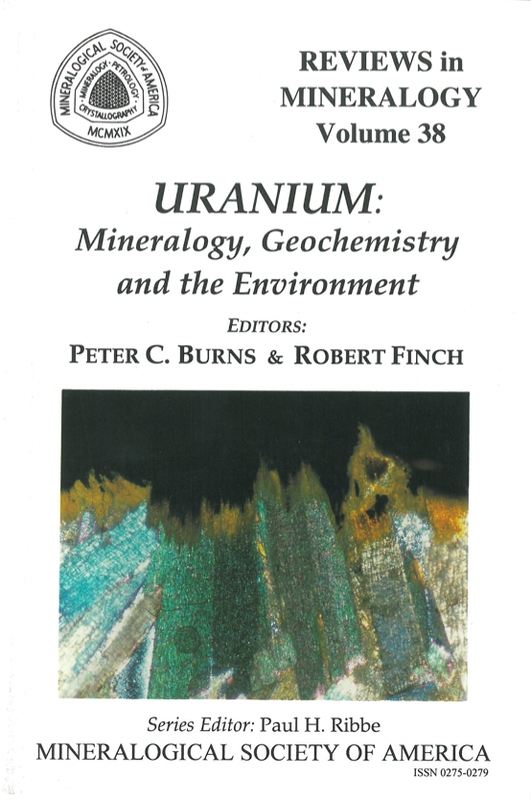 We have attempted to produce a volume that incorporates most important aspects of uranium in natural systems, while providing some insight into important applications of uranium mineralogy and geochemistry to environmental problems. 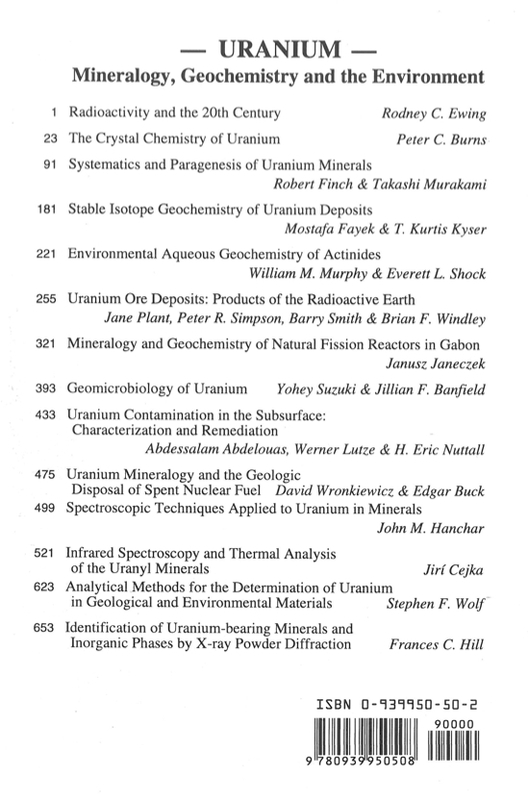 The result is a blend of perspectives and themes: historical (Chapter 1), crystal structures (Chapter 2), systematic mineralogy and paragenesis (Chapters 3 and 7), the genesis of uranium ore deposits (Chapters 4 and 6), the geochemical behavior of uranium and other actinides in natural fluids (Chapter 5), environmental aspects of uranium such as microbial effects, groundwater contamination and disposal of nuclear waste (Chapters 8, 9 and 10), and various analytical techniques applied to uranium-bearing phases (Chapters 11-14).